For home audio users who seek high-end sound quality suitable for archiving, AMÁRI is a reference grade AD/DA converter, that delivers 24-bit 384 kHz conversion and DSD256 support, an easy-to-use interface and trademark Antelope clocking. Unlike other audiophile converters AMÁRI has 2 headphone outputs with user-selectable output resistance, which works as headphone membrane weight compensation. This mastering-grade converter offers the industry-acclaimed Antelope Audio 64-bit Acoustically Focused Clocking (AFC) jitter management technology & up to 384 kHz, 24-bit conversion. AMÁRI offers top of its class D/A converter performance by implementing an unique 8 × DAC architecture (4 × CS43198 chips per channel). This enhances the stereo image, expands depth perception and unveils all the musical details with its 138 dB dynamic range. Apart from the main DAC, the headphone outs feature dual DAC architecture for maximum performance, just like the main A/D converter – using one AK5578 chip per channel, boosting the dynamic range up to 128dB. Unique headphone membrane weight compensation system with user-selectable output resistance. 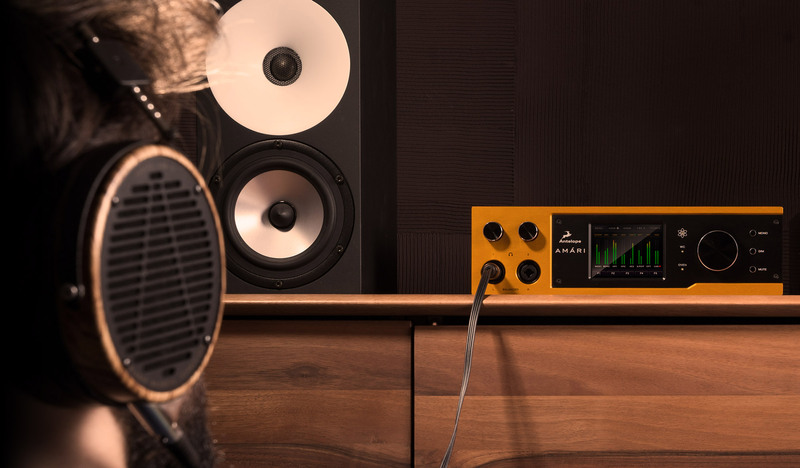 AMÁRI’s 2 high-power stereo headphone outputs (on XLR connectors) feature individual volume controls (capped at 20dBu max), with digital trim and selectable output impedance – from -4.6 to 85.3 Ohm, available in 17 control steps. These options let you configure AMÁRI for ideal compatibility with your favorite headphones, matching their impedance for best performance. AMÁRI’s high-fidelity headphone driver chip offers fully differential input (per amplifier). It is a dual-amp design, optimized to eliminate possible temperature drifts and deliver differential signal quality. The headphone outs also feature dual DAC architecture for maximum performance. This mastering-grade converter offers the Antelope Audio 4th generation, 64-bit clocking industry acclaimed Acoustically Focused Clocking (AFC) jitter management technology up to 384 kHz, 24-bit conversion.